Social replication is about reproducing your successful social purpose organisation, programme or set of core principles in other geographic areas to dramatically increase your impact and reach. Done correctly, replication can not only solve a social problem on a large scale, but also lead to improved financial efficiency, data collection and innovation. There are many different routes to replication. Below is a brief overview of the three broad types, from loose forms of Dissemination through to Affiliation strategies and then tightly controlled Wholly Owned replications. At the ‘flexible’ end of the spectrum is Dissemination. In this model you would create resources that enable an independent other to implement your venture in a new location. You may charge a fee for materials or advice but there is generally no ongoing financial or legal relationship. Alcoholics Anonymous (AA) replicated through open sourcing their principles. AA requires a group of alcoholics and ex-alcoholics to come together to support each other to stop drinking. No central organisation is required to oversee this model; members simply need to follow the Twelve Steps locally. AA has been highly successful and is now in almost every country in the world. 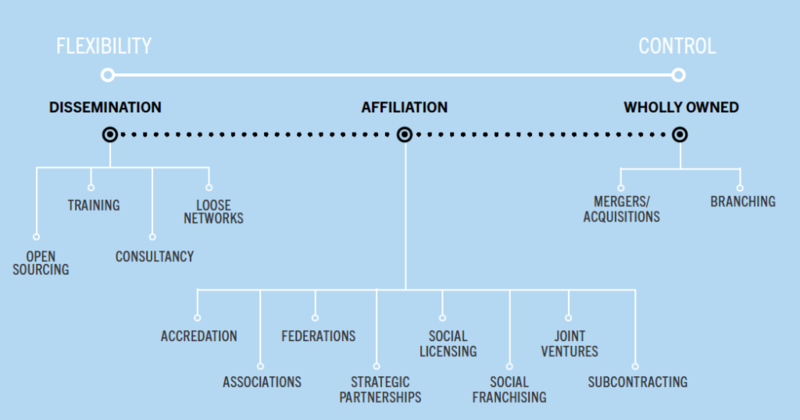 Affiliation is when an official on-going relationship with independent individuals or organisations is formed to help them implement your venture. There is generally a legal framework involved that sets out the nature of the relationship. Often there is a financial relationship between the two parties involved. Trussell Trust’s Foodbanks provide emergency food and support to people experiencing crisis. Foodbanks have been replicated using social franchising and forming partnerships with local churches and communities. The local churches are well placed to meet local needs while Foodbank provides you with all the tools, training and know-how needed to start it, so that people in crisis don’t have to go hungry. In this model you would carry out direct delivery of the programme in new locations, for example, through setting up local or regional offices. Street League aims to transform young people’s lives through football combined with structured programmes. Starting in London it replicated to Glasgow and the North East. Each of these operates a branch structure that keeps control of the project at the central level. Although the venture requires local tailoring the work involves high-risk groups, so more control is needed. Selecting the best replication model for your organisation requires considering a range of factors, from your organisational goals to your internal context and external environment. What are your objectives for scale? How does this fit into your overall vision and mission? What elements of your organisation can be replicated? What will the relationship be between your organisation and the planned replicator? What is the value proposition of the relationship? What are the financial implications of your proposed replication model for you and the planned replicator? What are the operational implications of your proposed replication model? How will social impact differ based on the different model? Who could take on your venture? For further guidance on replication strategies see ICSF’s Social Replication Toolkit. 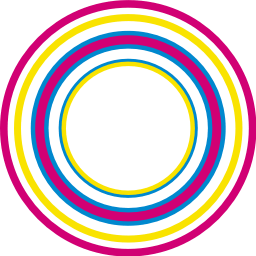 The International Centre for Social Franchising is a not-for profit social enterprise born out of a frustration of seeing social organisations constantly reinventing the wheel and wasting scarce resources.